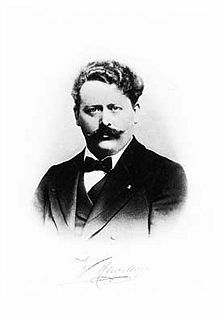 Joseph Willem Mengelberg (March 28, 1871 - March 21, 1951) was a Dutch conductor. He was the second of only six music directors of the renowned Royal Concertgebow Orchestra of Amsterdam and was a major influence in developing the ensemble into one of the world’s most renown orchestras. His tenure with the Concertgebow spanned 50 years from 1895 to 1945, one of the longest conductor-orchestra relationships in music history. He also served as music director of the New York Philharmonic from 1922 to 1928. An aggressive interpreter rather than a literalist, Mengelberg was one of the first conductors outside of the Austro-Hungarian musical sphere to recognize and advocate the importance of the Gustav Mahler's compositions. He was also a leading promoter of contemporary classical music such as that of Béla Bartók and Paul Hindemith. Like several other European conductors of the era, his reputation suffered after World War II for his failure to speak out against the Nazis. He thus ended his career in exile after having been convicted of being a Nazi collaborator. Mengelberg was born fourth of 16 children born to his German parents in Utrecht, in the Netherlands. Mengelberg's family would include several prominent musicians and critics. He was the uncle of the musicologist and composer Rudolf Mengelberg and of the conductor, composer, and critic Karel Mengelberg, who was himself the father of the prominent improvising pianist and composer Misha Mengelberg. He studied in the Cologne conservatory, learning piano and composition. At the age of 21, he was chosen as general music director of the city of Lucerne, Switzerland, where he was conductor of an orchestra and a choir, directed a music school, taught piano lessons and continued to compose. Mengelberg is most noted for his work as the principal conductor of the Concertgebouw Orchestra from 1895 to 1945. While there, Mengelberg founded the long-standing Concertgebouw Mahler tradition as he frequently programed Mahler's symphonies. He toured widely with the orchestra and also became known as a leading interpreter of Beethoven and Richard Strauss. Mengleberg met Gustav Mahler in 1902 and the two became friends. Mahler regularly visited The Netherlands to introduce his work to Dutch audiences. The composer also edited some of his symphonies while in Amsterdam in order to achieve a specific sonority for the famed acoustics of the Concertgebouw. 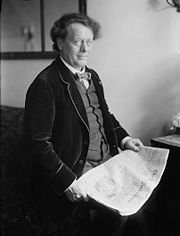 In 1920, in an unprecedented bit of programming, Mengelberg conducted the Concertgebouw in the ten Mahler symphonies over a series of nine concerts as part of his his twenty-fifth anniversary season with the orchestra. Mengelberg with The New York Times. However, Mengelberg's importance as a conductor was not only due to his Mahler interpretations. He was also an exceptionally gifted performer of Richard Strauss, and even today his recordings of Strauss's tone poem Ein Heldenleben, which had been dedicated to him and the Concertgebouw Orchestra, are widely regarded by critics as among the best—if not the very best—of this piece ever produced. On the other hand, one criticism of Mengelberg's influence over Dutch musical life, most clearly articulated by the composer Willem Pijper, was that Mengelberg did not particularly champion Dutch composers during his Concertgebouw tenure, especially after 1920. While retaining his post with the Concertgebouw, Mengelberg was also a frequent conductor of the London Symphony and the Royal Philharmonic Society from 1911–14, and again from 1921–30. He was also music director of the New York Philharmonic Orchestra from 1922 to 1928. In New York, Mengelberg made a series of recordings with the Philharmonic for both the Victor Talking Machine Company and Brunswick Records. One of his first recordings for Victor was a two-disc set devoted to A Victory Ball by Ernest Schelling. His 1928 recording of Strauss' Ein Heldenleben was later reissued on LP and compact disc. Beginning in January 1926, he shared the podium in New York with Arturo Toscanini. The collaboration was not an entirely harmonious one, however. Toscanini's biographer, Harvey Sachs, has documented that Mengelberg and Toscanini clashed over interpretations of music and even over rehearsal techniques, creating division among the musicians that eventually resulted in Mengelberg leaving the orchestra. The Concertgebouw in Amsterdam, where Mengelberg conducted for 50 years. Mengelberg was noted for a boldness of interpretation as a conductor. He is considered to have formed a link between the composing tradition of Wagner and Mahler, and the conducting style of the German master Wilhelm Furtwangler, in that he believed that a significant aspect of the conductor's role was to impart a personal interpretation to a given piece of music. This view of his art is understood by his supposition that, "The performer must help the creator" and that a slavish "faithfulness to the notes is a recent invention." This approach was the opposite of that taken by the literalists such as Toscanini, George Szell, and others who moved away from the interpretive style of the Wagner/Furtwangler tradition. It was not an uncommon practice for Mengelberg even to make alterations of scores (dynamics, instrumentation, and so on) which was thought by some to be sacrilege. He was also given to use rubato (fluctuations of tempo), and perhaps more than any other conductor he used portamento (gliding from one tone to the next) in the strings for expressive purposes. This is especially notable in his recordings of the Brahms symphonies. In addition to being perhaps the foremost Mahler interpreter of his era, Mengelberg was a serious advocate and promoter of contemporary music and conducted many important world premiere performances including Béla Bartók's Concerto for Violin and Orchestra No. 2 (1939), Paul Hindemith's Der Schwanendreher (1935) and his Violin Concerto (1940), Zoltan Kodaly's Suite from Hary Janos (1927), Darius Milhaud's Carnaval d'Aix (1926), and Ottorino Respighi's Concerto in modo misolido (1924). The most controversial aspect of Mengelberg's biography centers around his actions and behavior during the years of the Nazi occupation of Holland between 1940 and 1945. Some newspaper articles of the time gave the appearance that he willingly acquiesced to the presence of the Nazi's ideological restrictions on particular composers. Explanations have ranged from political naiveté in general to a general resistance to criticism of anything German, due to his own ancestry and appreciation of German culture. In any case, Mengelberg's cooperation with the occupation regime in The Netherlands during World War II resulted in his being banned from conducting in the country by the Dutch government after the war in 1945. He was thus stripped of his honors and his passport and was forced into exile. The original judgment required that Mengelberg be banned from conducting in The Netherlands for the remainder of his life. Appeals by his attorneys led to a reduction in the sentence to a ban of six years, retroactively applied to start from 1945. However, he continued to draw a pension from his orchestra until 1949, when further payments were cut off by the city council of Amsterdam. Mengelberg retreated to exile to Zuort, Sent, Switzerland, where he remained until his death in 1951, just two months before the expiration of his exile order. In addition to his acclaimed recordings of Richard Strauss' Ein Heldenleben, Mengelberg left valuable recordings of symphonies by Beethoven and Brahms, not to mention a controversial but gripping reading of Bach's St. Matthew Passion. His most characteristic performances are marked by a tremendous expressiveness and freedom of tempo, perhaps most remarkable in his recording of Mahler's fourth Symphony but certainly present in the aforementioned St Matthew Passion and other performances. These qualities, shared by only a handful of other conductors of the era of sound recording, such as Wilhelm Furtwängler and Leonard Bernstein, make much of his work unusually controversial among classical music listeners. Recordings that more mainstream listeners consider almost unlistenable are often hailed by others as among the greatest recordings ever made. Many of his recorded performances, including some live concerts in Amsterdam during World War II, have been reissued on LP and compact disc. While he was known for his recordings of the German repertoire, Capitol Records issued a powerful, nearly high fidelity recording of Cesar Franck's Symphony in D minor, recorded in the 1940s with the Concertgebouw Orchestra. Due to the Dutch government's ban on Mengelberg's conducting activities, he made no more recordings after 1945. Some of his performances in Amsterdam were recorded on the innovative German tape recorder, the Magnetophon, resulting in unusually high fidelity for the time. 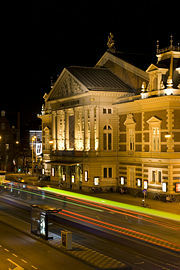 Sound films of Mengelberg conducting the Concertgebouw Orchestra, during live concerts in Amsterdam, have survived. Among these are a 1931 performance of Karl Maria von Weber's Oberon overture and a 1939 performance of Bach's St. Matthew Passion. Feder, Stuart. Mahler: A Life in Crisis. New Haven: Yale University Press, 2004. ISBN 0300103409. Lebrecht, Norman. The Maestro Myth: Great Conductors in the Pursuit of Power. Carol Publishing Group, 1991. ISBN 1559721081. Schonberg, Harold C. The Great Conductors. New York: Simon and Schuster, 1967. ISBN 0671207350. All links retrieved October 14, 2014. This page was last modified on 14 October 2014, at 20:31.